raise oyur hand if tu saw this coming. knuckles...........crazy............their both the same.. Wallpaper and background images in the shadow el erizo club tagged: shadow's friend freaking out. *raises hand*waaaaaaaaaaa! dont kill me!!! *calls shadow* shadow,be a dear and KILL NUCKLES!!! i raise my hand but what does that have to do with shadow. DONT KILL ME KNUCKLES! I THOUGHT WE WERE FRIENDS!!!!!!! haha knuckles is second coolest after shadow!!! 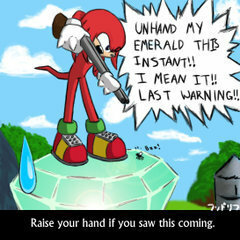 Knuckles is the guardian, after all *raise*. *raises hands* PLZ DONT KILL MEE IM ONLY A KID!!! I'M RAISING MY HAND!WHAT SHOULD I DO NEXT? heyyyy!!!! ARE WE THE FLY?NOOOOOOOOOO!!!!!!! !PLZ KNUCX DONT KILL ME! !I HAD SO MUCH MORE TO DO!!!!!!! *Raises hand*Yep.I knew that that would be coming..
*rasing hand* i've been rasimg my for like ever! *raises hand*i dont wanna die!!!WAAAAAAAAAAAAAAAAAAAAAAAA!!! i agree wit segafan silver sonic then knuckles but shadows after silver!!! *raises hand* Shadow, back mme up here.